Today we will talk about how to mix cabo-bondo and fill the mold to set up. Click here to check yesterday’s blog for the list of supplies needed. 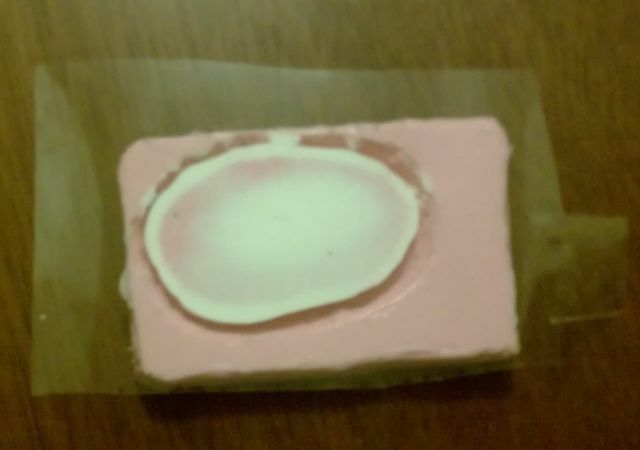 Click here if you want to learn what bondo transfers are and how they came about. CORRECTION: I updated yesterday’s blog list of supplies needed. I went back and added Epoxy Parafilm, which is a release agent to spray on the mold. Cab-O-Sil extremely harmful if inhaled so a respirator, that protects against particulates, is a must have. I use the goggles because in the past when I handled Cab-O-Sil, I have noticed a bit discomfort and irritation in my eyes. Since I am mixing it outside, there is more of a possibility the wind could blow it in my face. Most people I know don’t use goggles. Since I am only making a few, very small pieces I won’t be mixing much. Here are the steps I followed. 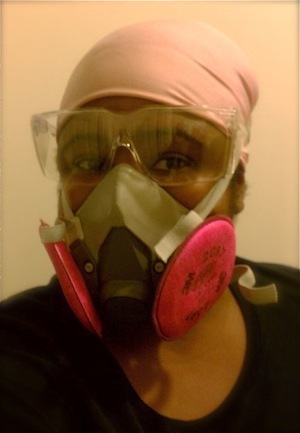 Secure respirator and goggles on the face. Spray the mold with a few layers of epoxy parafilm. Add Cab-O-Sil to mixing container. Add Pros-Aide until it becomes a paste. Mix until you have no lumps. Careful not to add too much air to the mix. Seal mixture in an air-tight container. I use a wooden tongue depressor to fill the mold. Adding it to the deep areas first and filling to the top. No need to over fill. Be careful to avoid air bubbles. Place acetate over mold, tapping or sliding gently with your fingers over the acetate. Using something with a flat edge, like a ruler, start in the middle of the piece and slide the ruler over the acetate to end of the piece. Continue this on all sides to remove any excess air bubble and create a smooth finish and thin edge. Don’t press too hard. Place filled mold in the freezer for about three hours. Depending on the freezer, some take an hour, others 5 hours. When the piece is ready the color we change from opaque to a more translucent color. De-mold immediately and set out to dry. If you let it thaw in the mold, you may not be able to remove it later. The piece will take 5 to 7 days to dry. You can use a dehydrator to speed it along. Use lowest setting, if the heat is set too high it could crack the piece. I had to eat this molten chocolate cake to have room in my freezer for the transfers. The sacrifices I make! The pieces I made are still in the freezer. I had to take the molten chocolate mini cake out of the freezer to fit the molds in. 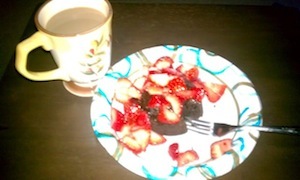 I didn’t want it to go to waste so I cut up a few strawberries on it to enjoy while I waited. Once they are pulled out to dry, I will apply them in a week or so. Also, still no response from Tinsley Studios as of today. I will try calling tomorrow and see what happens. Children should not be allowed to work with Cab-O-Sil or be anywhere near when you are working with it. 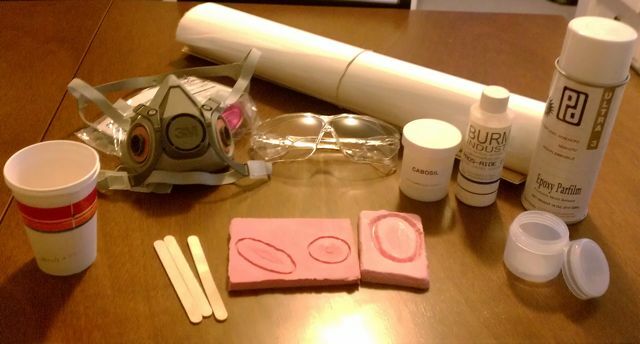 If you do not have the proper safety gear, you can still make bondo transfers. I will explain how in later post. Brilliant. I only had a tutorial from Todd Debrecini and he did the pure prosaide method, mixing it for 8 hours till thickened without Cabosil. The acetate you used was it just plain acetate? I was advised to use silicone treated acetate and I can’t find it anywhere in the UK.